Fun mini-donuts. A dozen in a bag or 6 of two flavors. Siracha donuts were actually good. Nice sweetness from the powdered sugar with a nice kick. Huckleberry donuts were great. Everything hot out of the fryer. And you are supporting the Salvation Army. Thanks for your support! We’re glad you enjoyed two of our new flavors! We hope you had a great time in Hoonah and at Icy Strait Point. Come back soon. We looked, we bought some Devils Foot cream that our local guide (Phil Jones, Kennel Creek Excursions) told us about. Wanted to buy in Hoonah from a "real" local, but she was closed. While you were here we hope you had a chance to explore some of the other shops, like where you posted this review, Lil’ Gen’s Mini Donuts! Thanks for coming to Hoonah, safe travels! Nice little snack if you are looking for something tasty that won't really fill you up. All kinds of different flavors. Small donuts with BIG flavors! Yummy tiny treats . . .
Get quick answers from Lil' Gen's staff and past visitors. 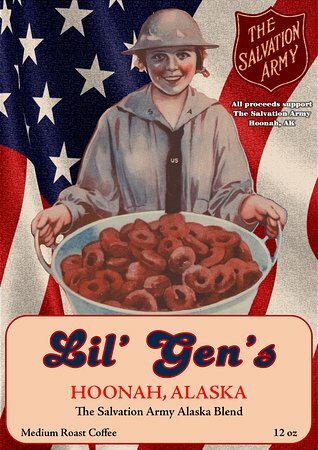 Can I order Lil' Gen's coffee online and have it shipped to my home? Yes! Please call us at 907-945-3359. If no answer please leave a message. Thanks!